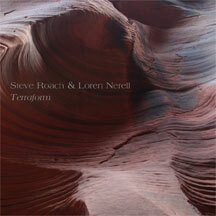 A budget-priced reissue of this 2006 collaborative album from Steve Roach and Loren Nerell. Terraform emerged from their mutual desire to create an organic, surreal and deeply ambient environment of languorous humid soundscape environments. Through a labyrinth of studio techniques, a kind of audio terraforming was developed. Heavily textured and mood altering, the long uninterrupted flow seemingly slows time down by way of the surreal dark ambient soundforms found in much of Roach’s work. Nerell brings the steamy, evanescent blend of his mutated Indonesian sources, a signature sound that defines his previous releases for Amplexus, Side Effects and Soleilmoon. Vivid ecosystems of sound abound on this field recording of the mind. Drones, liquid resonances and soothing walls of sound wash over the listener. This abstract sound painting includes hints of crickets, sounds vaguely suggestive of water, and deep otherworldly echoes. There is no melody, no rhythm; the feeling is cool, relaxed, and yet in the darkness there is warmth as well. The worlds Nerell and Roach have built do not exist on any map; their impact goes well beyond what can merely be perceived with one’s ears. Loren Nerell and Steve Roach met in Los Angeles in 1981 in the early days of the electronic music scene. It was a time when like-minded musicians who understood the importance of emerging technology were coming together in local clubs and performance venues to share what they knew and learn from one another. After years of friendship and occasional musical collaboration, in 2006 the two decided to convene in a relaxed setting to see what they could distill from a blending of their collective talents and individual styles. The two composers are both experienced in using the world around them as inspiration for their art; Nerell taped his Indonesian Soundscapes in 1999 and Roach, of course, has travelled the deserted rockscapes of Australia to come up with Dreamtime Return, an album now considered a milestone and a classic. In both cases, though, what you heard wasn’t a 1:1 conversion of their journeys, but the aural representation of a multisensory experience. Terraform emerged from their mutual desire to create an organic, surreal and deeply ambient environment of langorous humid soundscapes. Through a labyrinth of studio techniques, a kind of audio terraforming was developed. Heavily textured and mood altering, the long uninterrupted flow seemingly slows time down by way of the surreal dark ambient soundforms found in much of Roach’s work. Nerell brings the steamy, evanescent blend of his mutated Indonesian sources, a signature sound that defines his previous releases for Amplexus, Side Effects and Soleilmoon. Loren Nerell has studied gamelan music for the last twenty-five years, expanding and fine-tuning his mastery of Indonesia’s unique indigenous musical traditions through performances and field work. During this time he has accumulated a large number of field recordings, many of which he uses in his compositions. This has evolved from simply using the material as-is to an elaborate processing technique in which the material is taken to a point so far from its original source as to be unrecognizable. Impressions from several listeners have referenced Brian Eno’s seminal On Land recording.